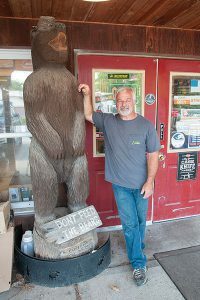 When customers arrive at Bear Hardware in Nashville, Indiana, they are welcomed by a giant carved wooden bear and a friendly team of employees. 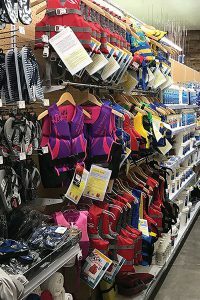 While the store has all the products anyone needs for a DIY project, it also caters to outdoor adventure-seeking tourists through its extensive camping department. Whether your business is near a campground, the beach or in the middle of a bustling city, selling customers the gear they need for any outdoor adventure is an opportunity worth exploring. Hardware Retailing spoke to retailers from Bear Hardware, Mountain Hardware & Sports and Camp Abbot Trading Co. to learn about how they have made camping a strong contributor to their operations. Read on for advice on attracting adventurous customers. We also take a look at the upscale camping trends, known as “glamping,” in the Last Word. 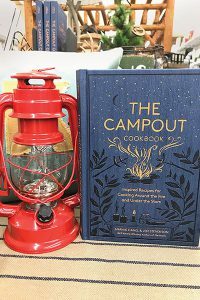 Emma Frisch, author of the camping cookbook, “Feast By Firelight,” and owner of a glamping business in Ithaca, New York, talks about her favorite meals to make and her must-have camping gear. Camp Abbot Trading Co. in Sunriver, Oregon, carries camping and outdoor gear for customers planning to spend time on the water. At Mountain Hardware & Sports, located in Truckee, California, the camping niche meets the needs of many different types of adventurers. Its proximity to camping and hiking trails is a major contributor to the success of the niche. However, Svahn says the products have enough crossover to make sense in most retail operations. Svahn emphasizes that retailers and employees should be excited and eager to promote the niche if it is something they bring into the operation. Camp Abbot Trading Co. in Sunriver, Oregon, is another business located in an area where outdoor activities are a major draw to visitors and locals, owner Bob Mitchell says. Bear Hardware also succeeds in the camping niche due to its proximity to Indiana’s largest state park, Scroggins says. Outdoor enthusiasts come to explore all year long, which often requires a visit to Bear Hardware for camping gear they might have forgotten at home. 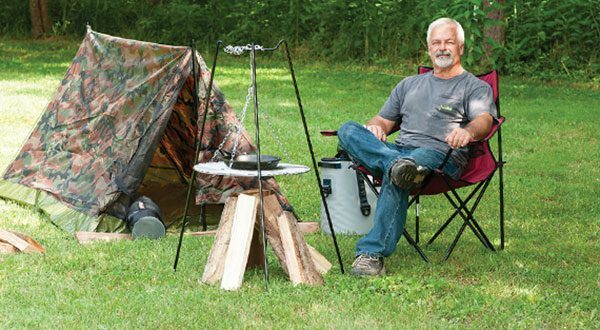 Retailers interested in the camping niche should have basics, but they should also consider what customers need to thrive in local terrain in different seasons. For example, Camp Abbot Trading Co. is located in a very dry climate. However, 50 miles west of the store it is very wet. Gear should to be tailored to the place a customer is going to be, which is a good question to ask to help a customer narrow down their choices, Mitchell says. Accessories such as cookbooks help diversify your camping selection with something unique. According to the 2017 North American Camping Report by Kampground of America, 61 percent of U.S. households include someone who camps. In addition, over 1 million households have started camping each year since 2014, resulting in 3.4 million U.S. households becoming new campers in the last three years. “Camping and enjoying the outdoors are very much a part of the everyday lifestyle of our employees and the customers we serve at Mountain Hardware & Sports,” Svahn says. 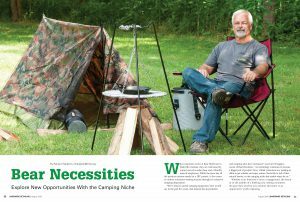 To ensure you have a well-stocked selection of products campers need, Svahn recommends offering everything from tents, sleeping bags and tools to products needed to cook and relax. According to Mitchell, Camp Abbot Trading Co. has a variety of camping goods that are in high demand in their sporting goods department. Customers who come through Bear Hardware before or during their outdoor adventure have a wide variety of needs they expect the store to meet, Scroggins says. The store sells premium outdoor cookware, grilling supplies, portable grills, fishing supplies and lures and outdoor toys for kids. Curt Scroggins, owner of Bear Hardware, helps shoppers find sporting goods and camping gear all year long. 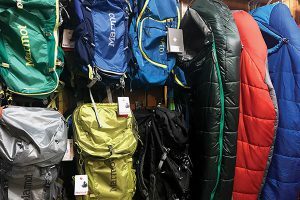 At Mountain Hardware & Sports, a large factor in driving sales and interest in the camping niche is the presentation of the products in the store, Svahn says. 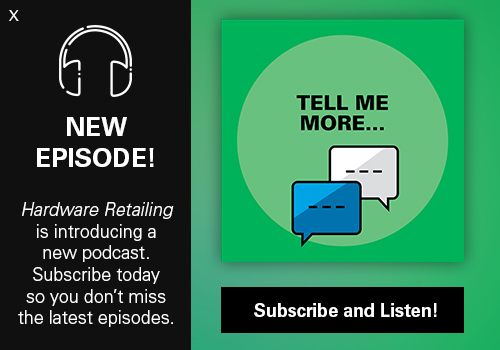 “We have a mixture of shortened aisles and endcaps, but we also have a lot of free-form space on our salesfloor, which allows us to make an impact,” she says. According to Scroggins, the emphasis on the camping niche in Bear Hardware is clear from its many aisles and variety of endcaps devoted to the products, as well as an open display area. 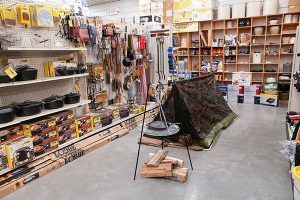 For example, Bear Hardware has a tent and chairs and a fire pit setup, along with a cot and sleeping bags, giving customers a visual for all the items they might need before roughing it outside. 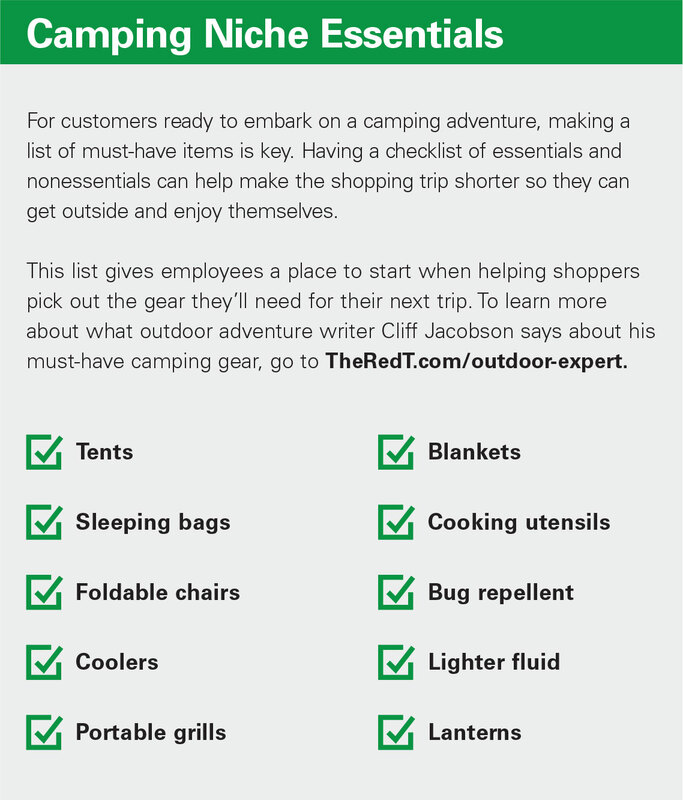 The camping niche has a better opportunity to spark interest among consumers if retailers implement well thought out merchandising techniques. All three retailers say having high-quality and well-recognized brands is something to consider when diving into the camping niche. This recognition among consumers helps prove that a retailer is an expert in the niche. Plus, many camping and sporting goods vendors will work closely with retailers to help them promote and sell their merchandise. Bear Hardware takes large items out of their packaging and sets them up for customers to see how they might be used. To establish your business, you need to have the right products and merchandising to attract customers. However, employees and managers should have some background or interest in camping to ensure sales and establish repeat customers. Mountain Hardware & Sports has outdoor adventure seekers on staff who are eager to assist customers with similar interests, Svahn says. Plus, unlike sporting goods box stores, the team can help in a more individualized way. “Big-box sporting goods businesses are well-known for their product offerings. 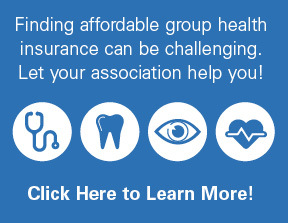 What they can’t do is home in on the needs of their specific communities like an independent can,” Svahn says. 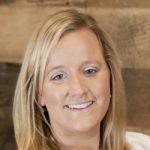 While big-box sporting goods retailers can help start the conversation and pique customers’ interest in outdoor adventures and camping, an independent retailer has the chance to be a stronger voice in their community by being there for their neighbors and providing them what they need, Svahn says. Bear Hardware has an advantage over big-box competitors because the business has established a reputation with its customers as the place to find products and knowledge, Scroggins says. “In areas like ours, we have a leg up on the big-box competition because we really know our customers and have the expertise on how to merchandise and sell the products a person needs in our location,” Scroggins says. In addition to building relationships with their customers, Scroggins says most of his employees enjoy being outside and participating in camping and other outdoor activities, which provides an added layer of service his customers appreciate. Mountain Hardware & Sports in Truckee, California, stocks the products customers shopping the area would need for a camping adventure. From backpacks and sleeping bags to portable grills and lanterns, a camper can find everything they need. Another way to educate customers on the products that are available and the experts in the operation is by hosting events that promote it. The annual event features a yoga instructor who will lead 40 to 50 participants in a yoga workout while the sun is setting. Svahn says the event raises money for the local humane society. 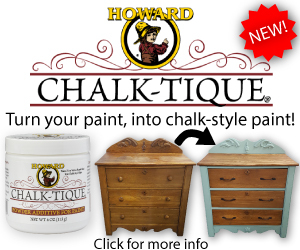 It is a great way to support the community and bring customers together to enjoy the outdoors. Svahn says retailers should focus on hosting community events or showcasing specific products offered, not worrying about the big boxes.